Wine in moderate amount has always been considered a tonic for heart. 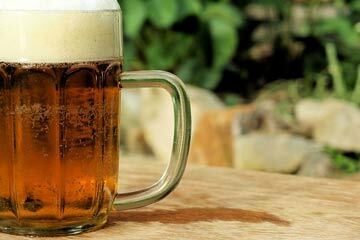 However, a latest research finds that a mug of beer might even be healthier for your heart than that of wine. According to the study1 published in Scandinavian Journal of Public Health Care, women who had beer once to twice per week were at 30% lower risk for heart attack than those women who either had none at all or more than twice a week. During the research about 1500 women between the ages of 32 to 60 were questioned about the frequency of beer, wine and hard alcohol consumption, along with their physical health. They followed up after 32 years to find that 185 women suffered from heart attack while 162 had stroke. 160 of them developed diabetes while 354 developed cancer. Thought the researchers found a correlation between modest beer consumption and a lower risk for heart attack, surprisingly, such links couldn’t be established for wine drinking. Such links between alcohol and heart health have been established before too. In a prior study2 published in New England Journal of Medicine involving 38,000 males, it was found that those who had alcohol 3-4 days per week were at lower risk for heart attack than those who consumed alcohol lesser than once a week. Mukamal KJ, leading author of the study, says that he isn’t surprised by the results. However, he also cautions that those individuals who have wine on a regular basis shouldn’t hurry with the switch. According to him we must focus on the bigger picture. Consuming one or two drinks per week appears beneficial for the heart. Such a beneficial effect of moderate alcohol consumption can be attributed to several factors. There is rise in HDL (good cholesterol), and reduces the stickiness of blood cells. The effect is seen through all kinds of alcoholic beverages. Modest beer consumption is also associated with reduced risk of hypertension4 and improvement in mineral bone density5. The latter effect may be because of high silicon levels in beer that promotes absorption of calcium and minerals, thus making bones stronger. Well, even though the study results have proved an association, during regular observation such association may not be visible. People consuming beer regularly are often have higher cholesterol levels, weight and blood sugar. Possibly such results may be because of the junk food people consume while drinking. So it’s advisable to not only control the drinking but also the food taken with it. The current NIH recommendation6 for women are to have no more than single alcoholic drink daily, while for men is no more than two a day. The guidelines should be followed irrespective of the consumed alcohol form—beer, wine or hard alcohol.